The Garden Square quilt block might look familiar to you. It is similar to one of the most popular patterns on this website -- but goes a little bit further. Can you spot the difference between Garden Square and Folded Corners? Once again, I went with a monochrome colour scheme for the simple reason that I wanted to keep the optical illusion of the corners folding down (hence the name of the other block), but this new nine patch block has the added feature of a square in a square patch for its centre. And ... as an added bonus, I created the block and two quilts in a different colour scheme as well -- to go more with the "theme" of this block name. 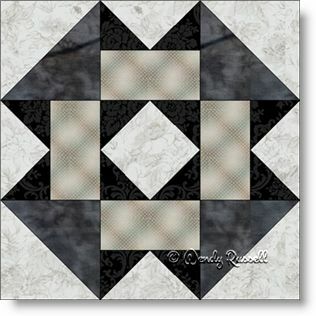 The four different sample quilts give you lots of inspiration to design your own special quilt with this easy quilt block.